Hot & Sour Rare Beef | The Essential Broth Co.
Add broth to a saucepan with the shallots, lemon, chilli, coriander root (save the tops to garnish), fish sauce and sweet chilli. Then simmer on a low heat for 10-15 mins. For a more intense flavour use more broth and simmer for a further 10 mins. Then strain. Add olive oil to a pan and sear off the rump steaks until rare (about a minute and a half each side). Season them well. Remove from pan and rest. Sautee on medium heat the mushrooms, carrot, crushed garlic gloves, Asian greens and oyster sauce until the veges are tender. Add cooked noodles to this, and toss through. Serve in bowls, and ladle the broth over top. 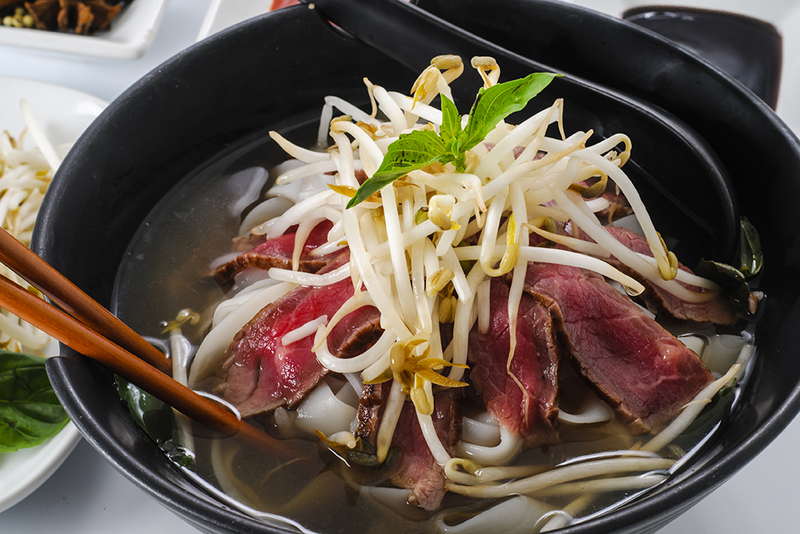 Top with thinly sliced rare beef, mung bean sprouts and fresh coriander. Handy Tip… Remove the fat from the Chicken and Duck Broth and keep for the perfect roasties. Duck fat roast potatoes are delicious! Toss with Flaky sea salt and fresh herbs.